Many people are concerned about using ozone generators, which is understandable. They are becoming a lot more popular lately, especially when using an ozone generator in the car. If you don’t know how to use an ozone generator in a car, it can be pretty easy. It’s important to know how to use an ozone generator, how long to run an ozone generator in a car, and more. However, the dangers of ozone generators are also important. There are many places you can use an ozone generator. You can use it in the house, in the car, in the basement, and more. The car is a place where you spend quite a bit of time, whether you drive to work, travel, or simply going to get groceries on occasion. Regardless of how you use it, there will always be things that get into the material of your car. Even if you’re a very clean person, you could still get those dreadful odors in your vehicle. Sweat, spilled beverages or food, smoking, and more can cause it to stink pretty quickly. This is because of the bacteria that are produced from our bodies or the things that we have. They will grow and become more apparent to you and anyone else that may ride with you. Fortunately, there are ways to get rid of these odor-causing bacteria. Ozone is a gas that is composed of oxygen molecules that have three oxygen atoms. Normal oxygen has two oxygen atoms. When you think of ozone, you might hear something of an “ozone layer”. This is natural ozone and should stay high above the Earth, but sometimes it is brought down through thunderstorms. These oxygen molecules can lower the quality of the air around you, so watching local weather reports is important if you have lung diseases like asthma or mesothelioma. Ozone gas is highly reactive to organic things. Humans, animals, plants, and microbes are subject to this. While it can cause a lot of discomfort in these things, it can also kill microbes. These include things like bacteria, viruses, mold, and other tiny things that may cause allergic reactions. This is why ozone generators can be used to remove odors! It kills the bacteria that you breathe in that cause these smells. Your body is reactive to ozone as well. It can have a lot of negative effects. These effects can be anything from inflamed lungs, headaches, sore throats, and more. People with lung diseases can suffer more than other people, considering it can make the symptoms worse. It’s very important not to use an ozone generator in an occupied space. Always remove people, pets, and plants from rooms or vehicles you’re going to shock with ozone. Fortunately, Ozone deteriorates after a little while. About one to two hours after the oxygen atoms combine, they will separate and become regular oxygen again. This means that you can breathe it without the harmful effects. It will be normal, everyday oxygen. As said above, vehicles can end up with some pretty funky smells. This is especially true if you or someone else smokes in your car. Pets can cause a lot of stink, as well as food or beverages that may have spilled. Bacteria spread and the scent will become more and more intense if you don’t clean it. It’s a great idea to keep your car clean, but sometimes, accidents happen. Make sure nothing organic is in the car. Never use ozone generators in occupied space, even in a car. People, pets, and plants should not be anywhere near an ozone generator when it’s on. Remove any possessions that you hold dear. This could mean books, any electronics or metal, or anything similar. Ozone has a negative effect on metal, so if you don’t want your phone damaged, make sure to take it out. Set your ozone generator outside on the ground. You can get a separate hose for it, but some of them come with the extra hose. Dryer vents also work well with it. 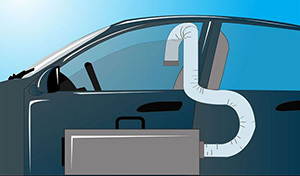 Stick the hose through a window and cover the remaining parts of the open window. You can use bags, cloth, or cardboard with tape. Anything that keeps the ozone in will suffice. Run the ozone generator for an hour or two, but never more than that. It can damage the interior of your car if you let it run that long. Just a couple of hours are enough to kill all the bacteria that are causing odor. After shutting off the ozone generator, you must wait an hour or two for the ozone to completely settle. Ozone is dangerous to breathe in, that much is true. However, if you use it correctly, it is one of the best air purifiers out there. It can destroy any microbe out there, including mold you might find in your house or the bacteria that cause odors. These bacteria can be tobacco smoke, body odor, and more. 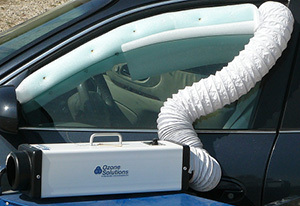 If there is a smell you can’t get out of your car, an ozone generator may be able to help. Setting it outside with a hose connected to it is your best bet. After you stick it in your window, it’s a good idea to cover the remaining openings with cardboard, cloth, or bags. Leaving it run for up to two hours will prove best results for your vehicle, making it odor free and smell like new again. Even professional car makers use ozone generators to clean the interior so it doesn’t smell bad.